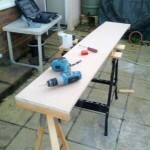 On Sunday, since it was a nice sunny afternoon I took the opportunity to build the baseboard for the model railway test track. 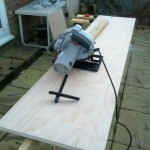 The main board – 22mm plywood – was an off cut from the local B&Q picked up for a few pounds. It was just a little larger that required, so had to wait for a suitable moment where I could get outside and cut it down. The idea for the test track is to have a run to track with a passing place, so allowing me to test basic wiring, including how to handle electro-frog points properly with motors, as well as some of the more advanced work such as occupancy detection, signals, and automated running. If I can get to the point where two trains will automatically pass each other then I would be very happy! 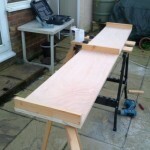 So back to the board – I’ve made it 180 x 30 cm, and added a couple of supports on the bottom. These are not to stop flexing, but to lift it up and ensure that the point motors on the underside don’t get damaged. The board doesn’t appear to flex much, but if that becomes a problem I can always add some reinforcing down one edge in the future. Below are some photos of the base board under construction…..
My next decision is going to be how to fix the track down – track pins or glue, and what to use as underlay. Decisions, decisions……. This entry was posted in Model Railway and tagged 2015, Baseboard, Model Railway, Test Track, Trains by John. Bookmark the permalink.